2016 HSBN POWER SHOWCASE champion Albert Hernandez with POWER SHOWCASE president Brian Domenico. 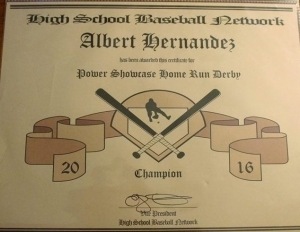 Archbishop McCarthy freshman Albert Hernandez entered the championship round of Friday’s home run derby knowing exactly what he needed to do in order to claim the title. With just two outs remaining the young slugger connected on a long shot to left field that sailed over the fence at Paul Demie Mainieri Field at St. Thomas University, and just like that Hernandez accomplished his goal. 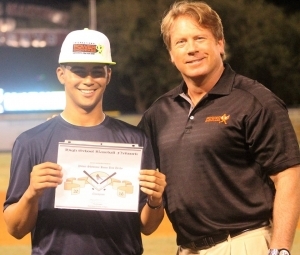 Hernandez narrowly edged West Boca junior Alex Cordero 3-2 to win the crown in Friday night’s HSBN POWER SHOWCASE derby, which kicked off the All-American weekend festivities that will continue Saturday at St. Thomas before moving to Alex Rodriguez Park at the University of Miami on Sunday. Hernandez also earned four of the five awards for his performance, adding the awards for the most consecutive, most preliminary round and most overall home runs. Hernandez also earned himself a complimentary invitation to the eleventh annual International POWER SHOWCASE, which will be held at Miami Marlins Park December 27-30th. Royal Palm Beach senior Tarik Latchmansingh earned the other award for the longest home run, a blast that traveled 400 feet and helped him advance to the championship round with three first-round longballs. Alex Cordero had four in the opening round and six overall, and Columbus’ Albert Espinosa, Westminster Christian’s Luis Aviles and Monsignor Pace’s Brandon Cruz all also advanced to the final round with three homers each. Hernandez was one of the final hitters to take his turn in the preliminary round, where he then put on a show with five “no-doubter” drives to move himself to the top of the leaderboard heading into the finals. The event was the perfect experience to start off the weekend. POWER SHOWCASE President Brian Domenico worked the two-wheeled jugs pitching machine in an open-bat format all night, while volunteer catchers Jonathan Roach and Juaquin Monque split time behind the plate and numerous volunteers shagged fly balls for each of the 22 participants. After arriving for a complimentary dinner followed by team meetings and jersey presentations, participants and their families were treated to the derby that capped off the evening.